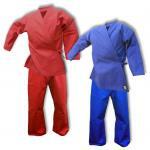 For the absolute peak of martial arts uniform durability, look no further than our Super Heavyweight Student Uniform. If your training is putting as much of a hurting on your gi as it is on your opponents, you may need to step up to this super-thick uniform. Woven from 100% cotton material, this 14oz weight cloth is heavy enough to stand up the roughest training session while still being easy to wash. The pants on this super heavyweight karate uniform are equipped with the same drawstring waistband style that has become so popular with today's martial artists. Both pants and jacket are constructed with reinforced, double-stitched flat seams guaranteed to handle serious sparring. If you're tired of cheap, so-called 'heavy' uniforms that seem to last one class before you spot a rip, you owe it to yourself to pick up one of our amazing Super Heavyweight Student Sets. You won't regret it! Set includes a 14oz jacket and pants.